Roasting cauliflower may not be the first method of cooking to come to mind when preparing cauliflower, but it can be a delicious alternative to traditional boiling or baking. 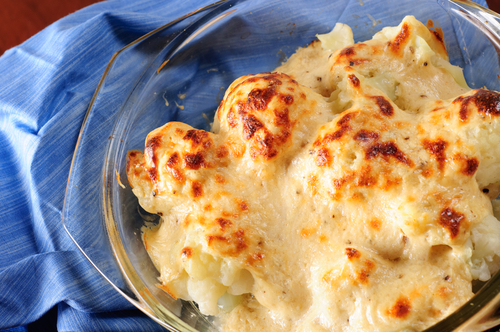 When roasted, cauliflower has a unique nutty taste that pairs perfectly with parmesan cheese. With a sharp knife, remove the core of the cauliflower head. Separate the cauliflower florets, cutting each in half to create one flat side. In a large bowl, toss the cauliflower with olive oil, salt and pepper. Spread florets out on a baking sheet and roast in the preheated oven for 10 to 12 minutes. Remove from the oven and sprinkle parmesan cheese over the top. Place back in the oven for 3 to 5 minutes, or until the cheese has melted.